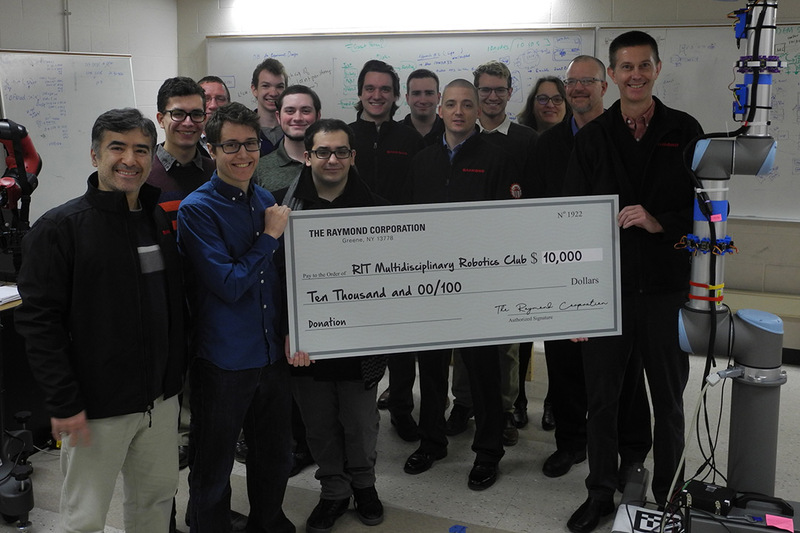 RIT robotics club receives donation from the Raymond Corp. The Raymond Corp. will help support RIT student robotics initiatives through a donation. Members of the organization and faculty and students from RIT’s Kate Gleason College of Engineering accepted the funds at a ceremony in the Multidisciplinary Robotics Lab in the college. Undergraduate students at RIT recently received a $10,000 donation from the Raymond Corp., one of the top material handling companies in the field today. The Multidisciplinary Robotics Club will use the funding to support current projects and professional development opportunities at conferences and national competitions. The team has designed different types of robots to compete at Motorama, BattleBots and IGCB where they have placed in the top-10 in these popular collegiate design competitions. Raymond Corp. has a long history working with RIT and its Kate Gleason College of Engineering, supporting senior design projects and faculty research initiatives, particularly in the area of smart warehouses. The company supplies the majority of high-end electric forklift and warehouse solutions in North America. They are continually developing equipment options to streamline operational processes and look to students such as those in the robotics club to help toward continuous improvement, said Erric Heitmann, vice president of engineering. “We are changing the way people think about materials handling,” he said, adding that automation will not displace workers, but allow employees to move onto more strategic responsibilities. Students familiar with the design and management of autonomous systems are integral to that type of strategic growth logistics companies such as the Raymond Corp. need. Development of “smart” forklifts and trucks that communicate with each other. The research project focuses on the design and prototyping of intelligent systems for a fleet of autonomous materials handling equipment to advance warehouse productivity and safety. During semester breaks over the past few years, graduate students traveled to the company’s Greene, N.Y., facility for an intensive, three-day work experience to help find ways to improve one of the company’s manufacturing workflow processes. Data and recommendations provided could contribute to continuous improvement efforts in the assembly department. Ferat Sahin, academic adviser for the student robotics club and co-lead of the robotics pillar of the Center for Human-Aware Artificial Intelligence, is working to embed more flexibility and autonomy into the robot’s system by integrating multiple biosensors toward what he calls collaborative robots—where the robots recognize objects nearby and can make autonomous decisions about actions. Students test site operations skills at Raymond Corp.